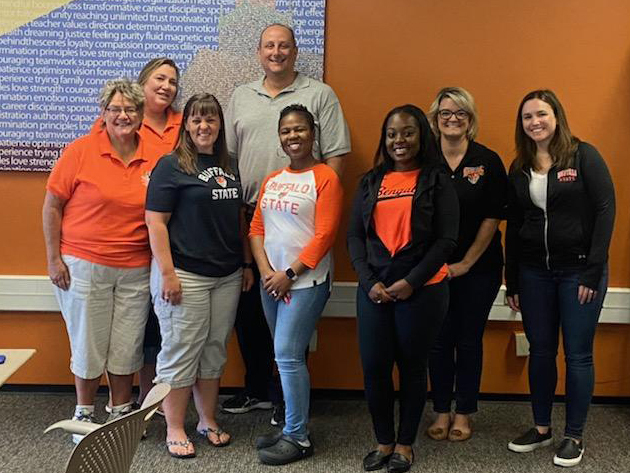 Through its mission, the Buffalo State College Career Development Center (CDC) provides comprehensive services to matriculated undergraduate and graduate students, alumni, employers, and faculty/staff. The center's staff assists students and alumni with career exploration and decision-making, gaining valuable experience, job search preparation, finding jobs and internships, and selecting and applying to graduate schools. Thousands of employers work with the CDC to list positions in ORCA, offer campus interviews and information sessions, and recruit talent at a variety of job fairs and other events. Employers also participate by helping students to write resumes, prepare for interviews, and develop social networking skills at events like Professional Image Boot Camp and Manners Matter. Events like these are the most visible programs, but workshops and classroom presentations are also offered throughout the year. Collaborating with a broad range of faculty and staff for orientation, student life, internship programming, and on-campus student and work-study employment, the center accepts invitations to speak in classes and at events on career, employment, and graduate school related topics. Through the reference services, the center also helps faculty and other supervisors in their efforts to support applications processes. For more information about the CDC, its services, and about career development itself, please browse the menus to your left and above.